The BiOM® T2 System is an ankle-foot device that enables amputees to achieve a normalized biomimetic response across all level-ground walking speeds. The BiOM T2 technology emulates muscle function by powering dorsi and plantar flexion to allow people with lower leg amputations to walk with a more normalized gait, using less energy to walk at a normal preferred speed, and better able to navigate uneven terrain. These benefits may potentially reduce musculoskeletal stress believed to be the cause of co-morbidities associated with the use of prostheses including osteoarthritis. The BiOM T2 System is the only commercially-available device for amputees that provides natural Bionic Propulsion. The device replaces the function of the individual’s lost muscle and tendon anatomy and provides more energy than it stores. All other ankle devices have a spring or hydraulic response during stance, and thus have net-negative propulsive energy, because springs and dampers cannot release more energy than they absorb. In distinction, the unique BiOM technology provides a net-positive power assist, emulating the missing calf muscles and energizing the amputee’s forward progression during each walking stride. Bionic Propulsion emulates normal muscle and tendon function by way of two bionic control actions. First, at heel strike, the BiOM provides programmable control of ankle-spring stiffness to absorb shock and to propel the tibia forward at midstance. Second, later in the stance phase, the BiOM provides programmable control of power assist [8, 13-15] – (Note: Citations and Links follow.) The BiOM controls torque and power to emulate normal levels of ankle-powered plantar flexion, pushing the amputee upwards and forwards into their walking stride. The action emulate the missing calf muscles of the human ankle joint, supplying net energy to the amputee’s walking stride for the first time in prosthetic history. 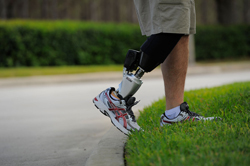 The BiOM System ensures each and every amputee walks with normal ankle behaviors across all walking speeds [3, 9]. This unique fitting paradigm is called Personal Tuning. Using a Bluetooth-enabled tablet computer, the prosthetist adjusts the BiOM System so that each individual’s gait falls within biological norms. The tablet produces documentation that the amputee is prescribed appropriately and that ideal parameters result in good outcomes. This documentation can be shared with the patient’s referring physician and payer. Navigate uneven terrain with less effort and greater speed. The BiOM System increases stair-climbing push-off power to that of non-amputees. Further, the BiOM allows users to increase their preferred walking speed while walking on rocky surfaces relative to passive prostheses. A. Grabowski, S. D’Andrea, H. Herr. “Bionic leg prosthesis emulates biological ankle joint during walking,” Annual Meeting of the American Society of Biomechanics, Long Beach CA, 2011. 2] H. Herr, A. Grabowski. “Bionic ankle–foot prosthesis normalizes walking gait for persons with leg amputation,” Proceeding of the Royal Society B, 279(1728), 2011. A. Grabowski, S. D’Andrea. “Effects of a powered ankle-foot prosthesis on kinetic loading of the unaffected leg during level-ground walking,” Journal of Neuroengineering and Rehabilitation, 10(49), 2013. A. Linberg, J. Shim, E. Wolf. “Use of a Powered Ankle Prosthesis to Decrease Work and Loading of the Intact Limb in Individuals with Transfemoral Limb Loss,” American Orthotic & Prosthetic Association National Assembly, Boston MA, 2012. 6] D. Morgenroth, A. Segal, K. Zelik, J. Czerniecki, G. Klute, P. Adamczyk, M. Orendurff, M. Hahn, S. Collins, A. Kuo. “The effect of prosthetic foot push-off on mechanical loading associated with knee osteoarthritis in lower extremity amputees,” Gait & Posture, 34(4), 502–507, 2011. D. Morgenroth, G. A. Gellhorn, P. Suri. “Osteoarthritis in the Disabled Population: A Mechanical Perspective,” The American Academy of Physical Medicine and Rehabilitation, 4(5S), S20-S27, 2012. S. Au, J. Weber, H. Herr. “Powered Ankle-foot Prosthesis Improves Walking Metabolic Economy,” IEEE Transactions on Robotics, 25(1), 51-66, 2009. H. Herr, A. Grabowski “Powered ankle-foot prosthesis improves metabolic demand of unilateral transtibial amputees during walking,” 34th Annual Meeting of the American Society of Biomechanics, Providence RI, 2010. 10] E. Russell, J. Aldridge, J. Wilken. “Powered prostheses influence transition work during level and uphill walking in individuals with transtibial amputations,” 60th Annual American College of Sports Medicine Meeting, Indianapolis IN, 2013. J. Aldridge, J. Sturdy, J. Wilken. “Stair ascent kinematics and kinetics with a powered lower leg system following transtibial amputation,” Gait & Posture, 36(2), 291–295, 2012. 12] D. Gates, J. Aldridge & J. Wilken, “Kinematic comparison of walking on uneven ground using powered and unpowered prostheses,” Clinical Biomechanics, 28(4), 467–472, 2013. 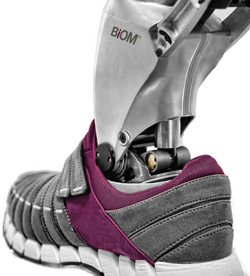 BiOM was founded in 2007 by Hugh Herr, Ph.D., the director of the Biomechatronics Research Group at the Massachusetts Institute of Technology Media Lab and a world leader at the frontiers of limb replacement and rehabilitation. Herr is a double amputee himself as a result of tissue damage from frostbite when he and a friend became stranded in a severe storm while climbing Mount Washington (New Hampshire) when he was only 17. A child prodigy in climbing, Herr was determined to resume the activity despite doctors and prosthetists saying he would never climb again. Following months of surgeries and rehabilitation, Herr proved them wrong. He created prosthetic feet with high toe stiffness that made it possible to stand on small rock edges the width of a coin, and titanium-spiked feet that assisted him in ascending steep ice walls. He used these prostheses to alter his height to avoid awkward body positions and to grab hand and foot holds previously out of reach. His height could range from five to eight feet. As a result of using the prostheses, Herr climbed at a more advanced level than he had before the accident, making him the first person with a major amputation to perform in a sport on par with elite-level, able-bodied persons. After the accident, Herr also threw himself into academics, falling in love with physics and a desire to improve life not only for himself but for other amputees. He went on to get his master's degree in mechanical engineering from MIT, a Ph.D. in biophysics from Harvard, and then post-doctoral work again at MIT. His mission at the biomechatronics center is to put forth fundamental science and technological capability that will allow the biomechatronic and regenerative repair of humans across a broad range of brain and body disabilities. His research program seeks to advance technologies that promise to accelerate the merging of body and machine, including device architectures that resemble the body’s musculoskeletal design, actuator technologies that behave like muscle, and control methodologies that exploit principles of biological movement. His methods encompass a diverse set of scientific and technological disciplines, from the science of biomechanics and biological movement control to the design of biomedical devices for the treatment of human physical disability. Herr’s work impacts a number of academic communities. He has given numerous invited and plenary lectures at international conferences and colloquia, including the IVth World Congress of Biomechanics, the International Conference on Advanced Prosthetics, the National Assembly of Physical Medicine and Rehabilitation, World Economic Forum, Google Zeitgeist, Digital Life Design, and the TEDMED Conference. He is associate editor for the Journal of NeuroEngineering and Rehabilitation, and has served as a reviewer for the Journal of Experimental Biology, the International Journal of Robotics Research, IEEE Transactions on Biomedical Engineering, and the Proceedings of the Royal Society: Biological Sciences. He has been invited to participate in joint funding proposals from other universities and corporations, and has served on research review panels including the National Institute of Health, the National Institute on Disability and Rehabilitation, and the Department of Veterans Affairs. In 2007, he was presented with the 13th Annual Heinz Award for Technology, the Economy and Employment. His work has been featured by various national and international media, including Scientific American Frontiers, Technology Review, National Geographic, the History Channel, and CNN. 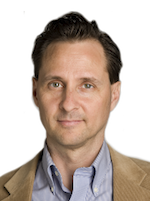 In addition to heading the biomechatronics group, Hugh Herr is an assistant professor, Media Arts and Sciences at MIT, and assistant professor, MIT-Harvard Division of Health Sciences and Technology. Please feel free to submit your questions on The BiOM® T2 System as well as any other issue you would like addressed.